Alexander (Sandy) Courage, composer of the original Star Trek theme and an Emmy-winning, Oscar-nominated arranger for TV and movies, died May 15 at the Sunrise assisted-living facility in Pacific Palisades, Calif. He was 88 and had been in declining health since 2005. Courage's fanfare for the Starship Enterprise, written in 1965 for the first of two Star Trek pilots, was heard throughout the three original seasons of the show and has been reprised in all of the Trek feature films and several of the TV series, especially Star Trek: The Next Generation in the 1980s and '90s. Courage's eight-note brass signature for the Enterprise may be the single best-known fanfare in the world. When told that more people know it than know Aaron Copland's Fanfare for the Common Man, Courage – in his typically self-deprecating fashion – said that must surely be an exaggeration. He won a 1988 Emmy as principal arranger for the ABC special Julie Andrews: The Sound of Christmas, and received Oscar nominations (both shared with Lionel Newman) for his adaptation scores for The Pleasure Seekers in 1963 and Doctor Dolittle in 1967. He was born Dec. 10, 1919, in Philadelphia, but moved to New Jersey as a boy and took up both the piano and horn. He received his degree from the Eastman School of Music in Rochester, N.Y. in 1941, then enlisted in the Army Air Corps and became a bandleader at various bases in California and Arizona. After the war, he began working for CBS Radio, composing and sometimes conducting for such shows as Hedda Hopper's This Is Hollywood, Screen Guild Theater, The Adventures of Sam Spade, Detective and Yours Truly, Johnny Dollar. From 1948 to 1960, he worked as an orchestrator and arranger at MGM, including work on the classic musicals Show Boat, The Band Wagon, Seven Brides for Seven Brothers, Guys and Dolls, It's Always Fair Weather, Funny Face, Gigi and others. He also scored a handful of films in the late 1950s, including Arthur Penn's The Left-Handed Gun and such drive-in fare as Shake, Rattle and Rock and Hot Rod Rumble. But television became Courage's primary outlet for composition, including various episodes of M Squad, Wagon Train and The Alfred Hitchcock Hour at Universal, National Velvet at MGM and The Untouchables at Desilu. 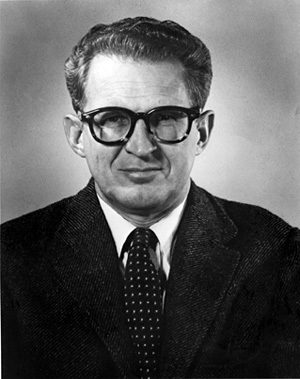 Much of Courage's 1960s output was at 20th Century-Fox, where Newman assigned Courage to write music for Voyage to the Bottom of the Sea, Daniel Boone, Lost in Space, Land of the Giants and other series. He wrote a dramatic theme and over a dozen scores for the Carl Betz legal drama Judd for the Defense in 1967-68. It was his only other TV theme besides Star Trek. In addition to his adaptation work on The Pleasure Seekers and Doctor Dolittle, he contributed orchestrations to such '60s musicals as Hello, Dolly! at Fox and My Fair Lady at Warner Bros. He also orchestrated dramatic and comedic scores for composing colleagues including Adolph Deutsch (Some Like It Hot), Andre Previn (Irma La Douce) and Alex North (The Agony and the Ecstasy). Star Trek, which went on the air in 1966, became his most famous work. In addition to the fanfare, series theme and scores for two pilot episodes, Courage composed the music for just four other hours of the sci-fi classic (two in the first season, two more in the third). He did far more work on The Waltons, scoring over 100 episodes in the 1970s and early 1980s, plus four Waltons TV-movies in the '80s and '90s. He also composed music for Apple's Way, Eight Is Enough and other series in the '70s and '80s, receiving an Emmy nomination as composer on a Medical Center in 1973 and another as arranger for ABC's Liberty Weekend ceremonies in 1986. He also served as music coordinator, and appeared onscreen as a conductor, in Luciano Pavarotti's 1981 film Yes, Giorgio. As composing work in TV waned, Courage returned to orchestration for old friends including John Williams and Jerry Goldsmith. For Williams, Courage orchestrated several scores including Fiddler on the Roof, The Poseidon Adventure, Hook and Jurassic Park. 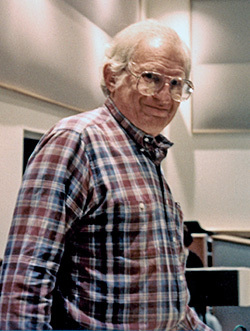 He also adapted Williams' themes for Superman IV: The Quest for Peace, and wrote many orchestral arrangements for the Boston Pops during Williams' 1980-93 tenure as conductor. For Goldsmith, Courage orchestrated numerous films including Basic Instinct, First Knight, The Mummy, Air Force One, Mulan and, ironically, Star Trek: First Contact and Star Trek: Insurrection. Courage also wrote large-scale orchestral arrangements for several recording projects, including Barbra Streisand's 1985 "Broadway Album," opera star Kathleen Battle's 1991 Christmas album, and violinist Joshua Bell's 1998 "Gershwin Fantasy" album. He was among the founders of the Composers and Lyricists Guild of America, the union that represented composers and songwriters in Hollywood during the 1950s, '60s and '70s. He was also an award-winning photographer whose photos appeared in such popular magazines as Life and Colliers. His third wife, the former Shirley Pumpelly, died in 2005. Survivors include four stepchildren and six grandchildren. Plans for a memorial service will be announced shortly. Help preserve the legacy of film and television music by supporting The Film Music Society!